Readers Write: UnitedHealth CEO and single-payer, Amazon's size and success - StarTribune.com: Motivations matter in debate over the future of health care. 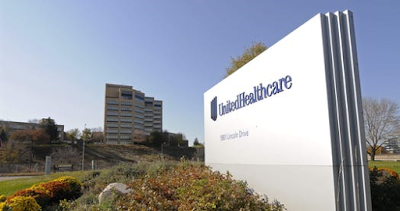 The UnitedHealth Group campus in Minnetonka. Speaking to investment analysts as his company announced a 22% jump in profit for the first three months of the year, CEO David Wichmann criticized the prospect of a government-led single-payer system. The April 17 article “UnitedHealth sounds alarm on single-payer system” ought to have more forcefully explained David Wichmann’s clear conflict of interest on this topic. According to statements filed for the 2017 fiscal year, Mr. Wichmann made $17,389,976 as CEO of UnitedHealth Group, an average of $47,643.77 per day for a 365-day year. When he makes pronouncements about the future of health care in the United States, and about making sure more of us have access to quality care, it’s important to understand that his job and all his personal incentive centers on the stock price and the profitability of the company he runs, and none whatsoever on the well-being of the citizens of this country. Of course he is speaking out against universal care of any kind; it would hurt the finances of the company he heads. He almost certainly has a whole team of people on this campaign. It’s startling to think he could buy a new car, and a nice one, outright, daily. How about a little transparent light on health care and turn off the gaslight? Fifty-eight countries have some form of universal health care. Switzerland has an interesting combination of government-subsidized health care and private insurance. The private insurance is strictly regulated by the government. A ranking of 11 industrialized countries measuring quality, efficiency, access, equity and healthy lives ranked the U.S. last, No. 11. The World Health Organization has ranked us 37th globally. We have the most expensive health care system with the worst outcomes. We pay astronomical prices for medications. The last two years with our current president has seen a rise of 3.2 million more people now uninsured. Twenty-eight million people in this country have no insurance. The American health care system run and regulated by corporate America is a disgrace. We all deserve better. Wichmann was quoted as saying some startlingly inaccurate assumptions about the proposed system of “Medicare for All.” He stated that a universal health care system would “surely jeopardize the relationship people have with their doctors … and limit the ability of clinicians to practice medicine at their best.” Meanwhile, the Japanese, who have a universal health care system, visit their doctors and clinics at a rate almost three times the global average and have some of the best health outcomes in the world. Americans are far less likely than comparable countries to have long-term relationships with primary care physicians and are much less likely to seek out care due to high costs. 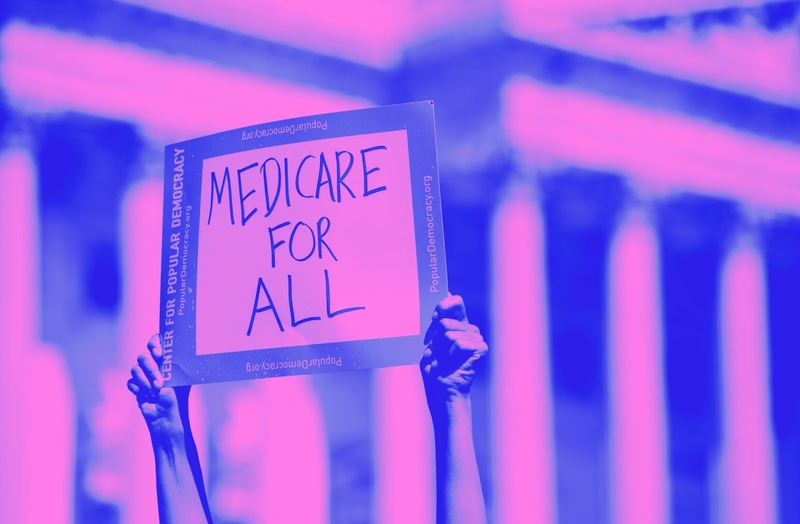 The Medicare for All system would significantly decrease the apprehension Americans have in seeking out care, thereby making health care far more accessible and improving our health outcomes. Wichmann also claims that a universal health care system would have an “inherent cost burden” on the economy; however, when compared with Germany’s universal health care system, which is mostly funded through premiums paid for by employers and employees, German employers pay 10% less than American employers in health insurance premiums, making their system a better deal for all involved, especially considering the amount of health care services individuals are entitled to through that system. 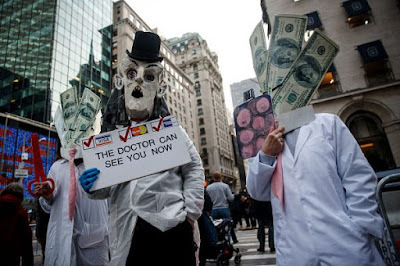 The evidence can be seen here in the United States as well: According to a Gallup report, there is a 77% satisfaction rate with the Medicare system, compared to 65-69% satisfaction rate with the employer or individual buy-in system and only 41% satisfaction rate among the uninsured. The profiteering on human lives and health in this country is abhorrent, which is why a universal health care system that would guarantee health care for all is the best choice for the progress of the American society. I’d like to hear Wichmann explain just exactly how a single-payer health system would “jeopardize the relationship people have with their doctors.” Sounds to me like he’s trying to stoke up irrational fear to preserve a vested interest. Company earnings of $3.47 billion in three months. I’m an old coot; I’ve had many doctors for many things, specialists for one thing or another that don’t require ongoing relationships. I’ve changed doctors for my convenience. One moved to San Diego; I found another. What’s the big deal? As to “destabilizing the nation’s health system,” that system is precisely the problem that needs solving. When I have a medical problem, I don’t want it regarded as a “claim” with some question as to whether it’s “covered” or “in-network.” I just want it taken care of without having to plead my case. Nor do I want what I pay for medications depend on a panel at Optima deciding how much of a sky-high arbitrary asking price that pharmaceutical companies peg their products at will be accepted, keeping quarterly earnings in mind. I retired a few years ago, forcing a switch to Medicare from my employer-paid (except for my 20%) health insurance. The only disruption I experienced was a premium reduction; my Medicare premiums, including the part D supplement, were cheaper than my 20% contribution to my employer’s plan. I kept the exact same set of doctors and other health care providers, and even had my coverage through the same insurance provider. A couple of years ago, I switched to an even cheaper plan with a different provider. But again, I continue to see my same doctors. The copays on this second Medicare Supplement plan are higher, but my premiums are lower. And the annual out-of-pocket max for both of my Medicare Supplement plans are lower than the annual out-of-pocket max for my former employer’s plan. Robin Vos unmoved by poll showing support for Medicaid expansion: 'Sometimes you have to lead by what you believe in' | Local News | madison.com: Meanwhile a new UW-Madison study found Medicaid expansion could save up to $100 million a year in Wisconsin. SeniorCare prescription drug program to continue for 10 more years: The program is an alternative to Medicare Part D prescription drug program that supporters tout as more comprehensive and less expensive. High-Deductible Insurance Linked To Delays In Cancer Diagnosis And Treatment : Shots - Health News : NPR: Her employer offered only a high-deductible health plan; that meant she'd have to pay up to $6,000 out of pocket each year. Advocates for patients say this sort of underinsurance is snatching lives. Bernie Sanders's Medicare for All Goes Too Far for Most Americans - Bloomberg: The U.S. health-care system needs serious reform, not a radical remake. A 'Medicare For All' Question Backfired At Bernie Sanders’ Fox News Town Hall | HuffPost: The audience was not afraid of the 2020 contender's plan to switch all Americans to a government-run insurance plan. Why Butte County needs Medicare-For-All more than ever – Chico Enterprise-Record: New Medicare-for-All legislation (The Medicare for All Act of 2019, HR 1384) was just introduced in the U.S. House of Representatives by Rep. Pramila Jayapal (D-Wash) with 103 cosponsors. The Butte County fire in which the beautiful town of Paradise was destroyed was a heart-wrenching experience for my wife and me, especially wistful since we had visited our dear friends there frequently in years past. Our friend and health care reform colleague, Paul O'Rourke-Babb, describes in his article what this meant to so many residents of Butte County. It was a terribly tragic event that only those who were there to experience it can truly comprehend. Maybe it would not have made much difference during the urgent moments of the fire, but it can make a very big difference now for those who lost their work and the health insurance that went with it and are now facing medical bills that compound the financial hardships that they are facing. We can do only so much to try to console those facing grief, but at least we can take worries about paying for health out of any future tragedy like this - by enacting and implementing single payer Medicare for All. Health care: Bernie Sanders sharpens the choice Democrats face - CNNPolitics: Congressional Democrats are locking arms to protect the Affordable Care Act -- the party's signature achievement during Barack Obama's presidency -- as President Donald Trump renews his efforts to repeal it. Want to Combat the Opioid Crisis? 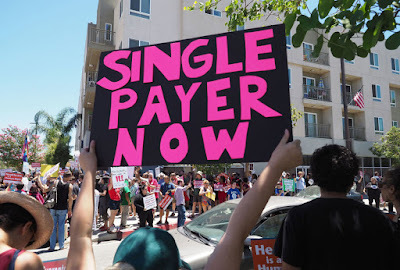 Pass Single-Payer Health Care. : A for-profit health care system that has generated billions for Big Pharma won't combat the opioid crisis.